The North Carolina Department of Public Instruction Testing Code of Ethics requires that proctors be present to serve as additional monitors to help the teachers assure that testing occurs fairly and to help maintain a positive and orderly testing environment. Those interested in serving as a proctor will need to register as CMS volunteers online at www.cmsvolunteers.com if not already registered. Individuals will undergo a criminal-background check during the registration process. Volunteers should also contact the school(s) they would like to serve as a proctor. Persons already registered as CMS volunteers also need to make arrangements with the school(s) they wish to serve as a proctor. Please contact your local CMS school AS SOON AS POSSIBLE to let them know of your availability or for further information. 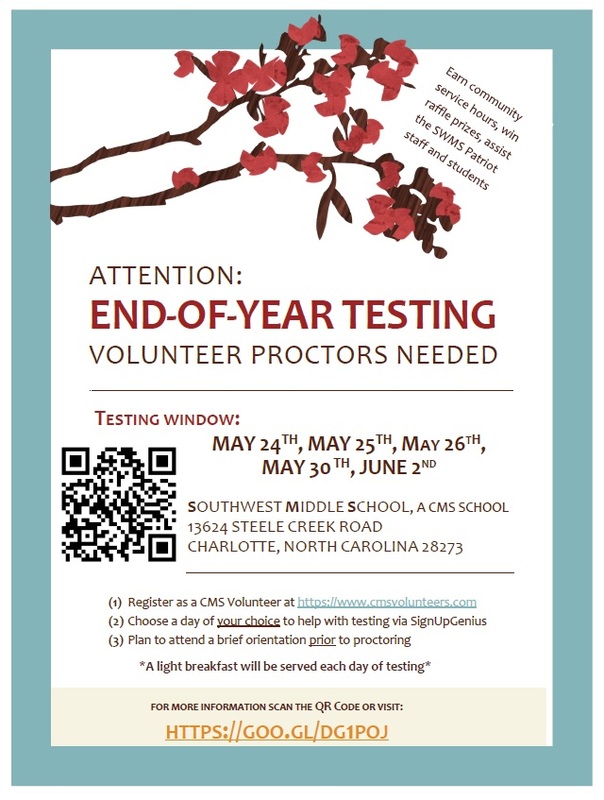 Schools are in dire need of volunteers during End of Year Testing. Southwest Middle School needs 80 volunteers each day of testing. For Souhwest Middle School, you can sign up at SignUpGenius. Contact information is on each school's web site, linked below. See the CMS Volunteers and Partners web page for more information about volunteer opportunities at local schools. Or contact Ana Brown, the district volunteer coordinator at 980-343-0474 or ana.brown@cms.k12.nc.us.